For over a decade, Wylie Dufresne provided perhaps the single most convincing argument for the importance of culinary risk-taking in New York City as the chef of wd-50 (2003-2014). In that restaurant’s kitchen, Dufresne developed a unique body of work, fostered young talent, and earned one Michelin star and a James Beard Award. The critic Frank Bruni once wrote of Dufresne’s methods, “he pushes hard against the envelope of possibility and the bounds of conformity to produce food that’s not only playful but also joyful and even exhilarating.” In 2013, Dufresne opened Alder, in the East Village. It is the chef’s take on the traditional American public house. 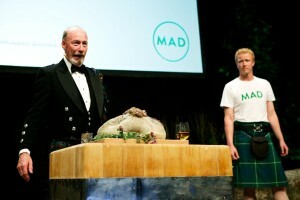 In this speech from MAD2, he describes how realizing that he knew very little about cooking—and his desire to know more—has been his greatest inspiration. 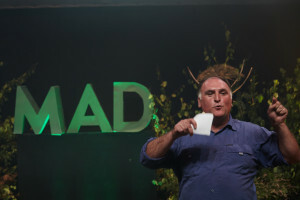 A champion of sustainability urges chefs to pay attention. 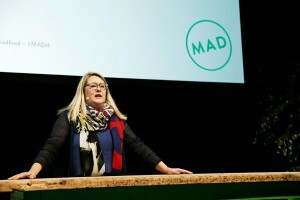 Three-time James Beard winner Anya von Bremzen on the importance of fantasy in dining.